I don’t know about you but I love history. Be it music, football, the history of the city I’m living in (one of the most beautiful cities of the world; Breda) or tragedies of the world. Or sometimes the beauty of tragedy. I want to read about it and storage the knowledge in that big head of mine. Politics not so much expect for political strategies which went wrong during certain events. Therefore I’m very interested in the history of the Stasi in former DDR for example. When we talking about tragedies I’m talking about wars and especially World War I and II. And although lots of bands have topics about the inhuman horrors and fear during WWII, I’m thrilled to know there are still people around who have lyrical inspiration about WWI, the Great War. We know a lot about WWII because the Nazis had a perfect score when it comes to administration, but if you paid attention during your history lessons, you will probably know lots of morbid stories can be told about WWI as well. Mustard gas, Leuven and Dinant…search for it if you aren’t familiar with WWI. 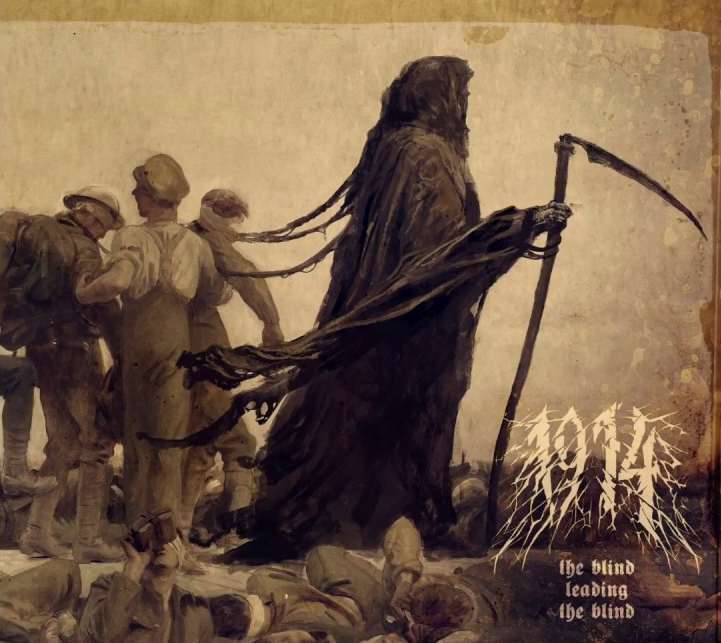 1914, the year WWI began, is here with their second full-length filled with Blackened Doom/Death Metal and you will not be disappointed for one bit, I can guarantee you that. A nice touch by the way, they have released it on Armistice Day (100 years since the end of World War I). Besides haunting Doom/Death riffs, galloping drums and variation in speed as well as vocals, 1914 also are using a violin (!) and great samples to enhance the atmosphere. The violin is really a top notch idea as it adds melancholy to the subject at hand like during the Third Battle of Ypres, the Battle of Passchendaele. Also a great job by David Ingram on this track “Passchenhell”. The samples are music of that moment, soldiers screaming, chanting (“Hanging on the Old Barbed Wire”), officers talking, grenade impacts, gun fire…all done in the right way, at the right time. Just listen to “C’est mon dernier pigeon” which starts with conversations between privates and someone of a higher rank, asking about the riffle (“a soldier best friend”) one is holding and the other about marriage, ending the conversation with “I bet your mother is proud of you”. Than a grenade impact and the officer ends with “Good luck soldier, carry on”. And as a listener…you know they know they were going to die.